We sure were on a springtime roll here in Atlanta the past few weeks. There was a day where it was 86! The flip flops were already in the rotation. Patios all over the city were cleaned up and full to capacity for al fresco dining. We were already in a summertime frame of mind…and then suddenly, a switch was flipped. Turn the HEAT on!? Where is my favorite sweater and hat!? Put an extra blanket on the bed!? Oh bother. Like everyone else here, I have been in a lighter frame of mind when it comes to cooking. In addition to the cornucopia of veggie dishes, I have already added a few cold soups to the repertoire. Gazpacho has always been my go-to summer soup (my mom’s recipe is incredible). However, I found this recipe while browsing through Food + Wine’s website. With the exception of mint, which I don’t really care for in cold soup, everything about this recipe sounded delicious. I made my first batch of this a few weeks back but felt guilty posting a cold soup recipe when its colder outside than it is in my refrigerator. Now that we’re back to normal – gorgeous sunshine and short sleeve weather – it’s time to share it. 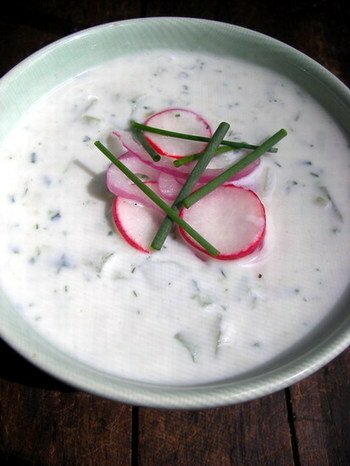 – In a small bowl, toss cucumber, radishes and garlic and 2 tbsp. each of the mint and dill. In a medium bowl, whisk the yogurt with the milk, lemon juice, and olive oil. Stir the vegetables into the yogurt mixture and season with salt and pepper. Set the bowl over a larger bowl of ice water and stir occasionally until chilled, about 10 minutes. Ladle the soup into bowls, sprinkle with the remaining herbs and serve. Editors note: Since I’m not for mint, I garnished mine with some chives and some red onions & radishes that I gave a quick pickle in some vinegar and salt. I prefer the salty/tangy to the minty taste…but to each their own! I should not be looking at this! I’m soooo hungry and that is so scrumtrulescent! I am saving this recipe for some of those hot July and August days. It looks so perfect, I always have trouble balancing the yogurt and lemon juice just right. Thanks as always. Looks divine… but sadly, it’ll be a while before I’ll be giving the recipe a go, as autumn fogs are rolling in on us here in Melbourne. Wow. That looks delicious. I cannot wait for gazpacho-making weather.